The baby shower invitation comes. The happy parents-to-be have got basics covered. I want to give a book. But not a book that someone else is also going to give them. So, I skip past most of the supermodels of infant books (The Very Hungry Caterpillar by Eric Carle, Guess How Much I Love You by Sam McBratney, Where's Spot by Eric Hill). Instead, I go for one of these overlooked beauties. I Kissed the Baby! by Mary Murphy. I adore this book's bold black backgrounds and and simple silhouettes. In it, the whole neighborhood gets to meet a baby chick. "I held the baby, did you hold the baby?" The story culminates with sweet baby kisses. Pat the Bunny by Dorothy Kunhardt. This interactive classic invites readers to complete sensory tasks. Ashley and I like that it's not all rubbing faux fur. Readers are poking, lifting, and looking as well as rubbing. Published in 1940, you could call it the original touch-and-feel book. Nursery Rhyme Comics by Various Authors, Chris Duffy and Leonard S. Marcus. This is one that parents can enjoy before baby is born, then read in bits and pieces to their child as his attention span grows. With so many different rhymes and styles (fifty!) there's sure to be something that everyone likes. Full review here. Walk On! by Marla Frazee. I love Marla Frazee's vintage style. In this book she gives babies a handy guide for how to walk -- checklist included. "Are your shoes too tight or too loose? Is your diaper weighing you down? Fix whatever you can before you start over." It's funny and sweet, and just as applicable to taking the first steps into parenting as it is to babies taking their literal first steps. Cinnamon Baby by Nicola Winstanley and Janice Nadeau. This book speaks to me in a beautiful way. When I think of it, I know I'm not alone in believing that parenthood can be both unbelievably taxing and the most treasured experience. It tells the story of Miriam the beautiful baker, her loving husband Sebastian, and their beloved, colicky baby. Full review here. Barnyard Dance! by Sandra Boynton. Ashley and I think it is so fun to introduce new moms to Sandra Boynton. Barnyard Dance was one that I received as a shower gift and I've shared that love a couple times. There's something irresistible about Boynton's rhymes -- they just fall out of your mouth as if you've known them your whole life. And her pen-and-watercolor illustrations are completely unique. Somehow her farm animals, monsters, penguins, and dinosaurs are incredibly cute. Happy Birthday to babies everywhere! These are all tried-and-true (meaning it's bearable to read each one more than three times in a row). 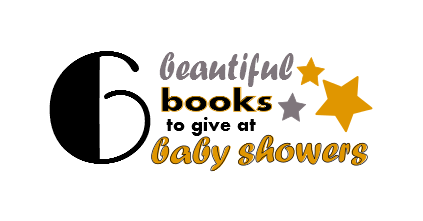 What are some of your favorite books to give at baby showers? What is a favorite you've received? *This post was updated with affiliate links on 10/9/2014 If you make a purchase after clicking, I will earn a small commission. Thanks for helping to make my passion (sharing books!) profitable. We also got Sandra Boynton's "Going to Bed Book" as a baby shower gift, and that's definitely been a classic in our home. And my stepmom picked up "Goodnight Moon 1-2-3" for my oldest when he was a little dude, and he and my second both love it, especially the "Nine red balloons" page and the "One hundred stars." It's a lovely twist on the old classic. Good post dear! I like to give books too. I am also a fan of Sandra Boynton (I could have even named her as the author of those books if you can believe it! Our favorite is the one Ashley mentioned. My favorite series to introduce people to are the Gossie books. Have you read those? They are absolutely darling and had the boys giggling and giggling from the time they were 18 mo till 4 years! We love Gossie! My favorite book I have ever been given at a shower was "Truman," by David McCullough. Not for the kiddo but I was still so happy to have it! And who says the book has to be for the kid? JaNae Tanner gave me a nookbook giftcard and said "I know you'll be reading lots when baby can't sleep at night and needs to be held or fed." Wasn't that nice?!? I loved it! I really like Boynton's books too -- and Barnyard Dance is my favorite. In fact, now I ask to read it more than Addison does! A childhood favorite of mine is "Each Peach Pear Plum"; I still love it so I give it as a new baby gift frequently. llcall -- I actually JUST gave someone "Each Peach Pear Plum"! I think it makes a great gift for the older sibling of a baby. Y'know, with the I Spy element. Ooo--the "Nursery Rhyme Comics" looks fun. When my kids were little, ALL of the Sandra Boynton books were a hit, but our favorite was "Snoozers". Amy, I haven't read Snoozers! I will have to check that one out. Nursery Rhyme Comics really is so good! Your fam would love it. You can borrow it from me if you like! That is such a great baby shower idea! Why I have never considered it is beyond me. I just look at the registry and get something so I know they want it and no one else will be getting it. A great first book for baby is awesome. Thanks for thinking of something so obvious and awesome that I overlooked!